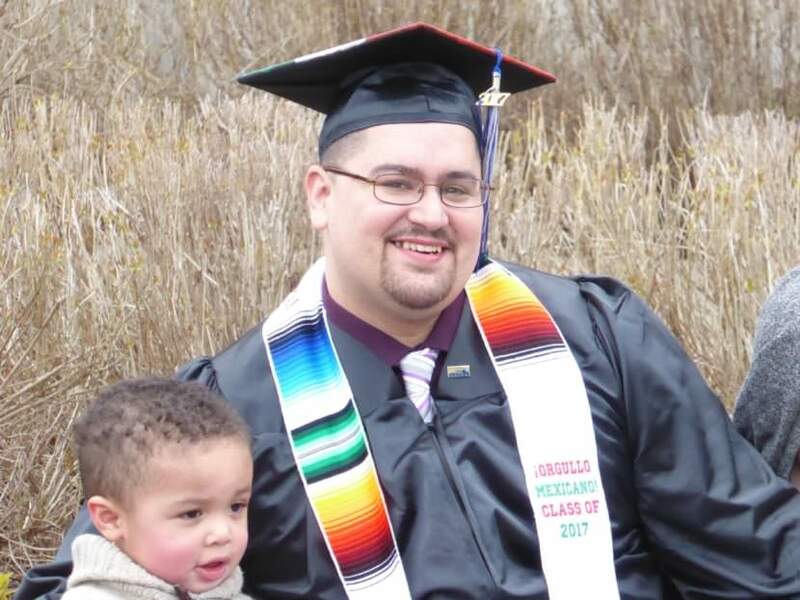 This month, 30-year-old Marcos Galindo graduated with a bachelor’s degree in social science with a concentration in political science. Now, he’s working on a master’s of public administration and wants a Ph.D. in Chicano studies – a choice weighted by his early life on the streets and in the prisons of California. “Especially in the gang culture of California, it’s a lot of false propaganda about what it means to be one’s brother’s keeper, what it means to be para la raza — being Mexicano and being Chicano,” Galindo said. Feeding into that “propaganda” landed him in prison, Galindo said. “I want to know the historical accuracy of what it means to be my brother’s keeper, and I want to know the true meaning of what it means to be Chicano,” Galindo said. Galindo’s story starts in California. He said he came from a broken home and like a lot of kids from broken homes, he started partying and acting wild in his teens. He was arrested for fighting and was sent to juvenile hall where he said race determined everything. Galindo used his new status to vent the anger he was holding in. “I loved it. I loved the fast lifestyle; I loved people being afraid of me; I loved the fast money; I loved packing a gun; I loved all of that,” Galindo said. But of course, that put Galindo in prison where he ended up doing someone a favor. That favor increased Galindo’s time from 18 months to five years. He was released at 25 but ended up going back pretty quick. “So, I got thrown up in the hole and then I seen the individuals who are running the show, right? These big time players in the O.C., of the organization I was part of and they were all heroin addicts. They were all old 60-year-old, 50-year-old heroin addicts,” Galindo said. Then Galindo ran into his brother, who is serving life in prison for murder. That was it. Galindo’s mom invited him to come to Juneau; he came. He landed two jobs and started making good money. But someone called Galindo a racial slur and he beat the guy up and was arrested. Authorities “threw the book” at him, he said, when his criminal history came up. “Kudos to Juneau for that, trying to nip this stuff in the bud,” Galindo said. He was sent to Lemon Creek Correctional Center where he joined the Flying University, a program that brought University of Alaska Southeast courses in philosophy and literature to prison inmates. UAS students on the outside also came. The plan was for the students and the inmates to learn from each other. It evolved into a prison re-entry program. Galindo also learned he was a father while in prison and he rekindled his faith. Those three things: school, faith and family, pushed him to change a second time. Galindo is one of three Flying University alumni who graduated this month. Another former inmate, Nathan Block, earned a bachelor’s degree with an emphasis in literature and minors in philosophy and Tlingit. Thomas Spitzfaden, a regular student who took classes in Lemon Creek with the inmates, graduated with a bachelor’s in social science. Anthropology was his primary and he had concentrations in psychology and political science. There are three other Flying University students taking classes at UAS, Galindo said. He thinks education is a powerful weapon and a cure for many of society’s problems, including the high rate of former felons who go back to prison.